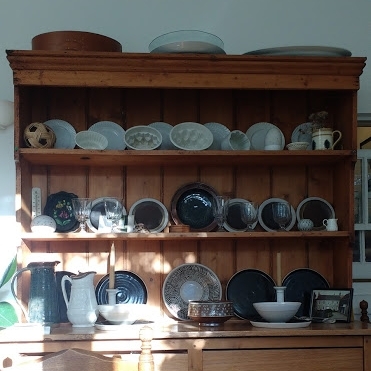 When I first started designed my Feast collection of serving-ware memories of our family's history of properly-served meals is what immediately came to mind. In the first of a monthly series of blog posts I am looking under the skin of my work to some of the influences and elements that have come to define my style. My family was always big on eating together. Dad grew organic veg on the allotment, mum cooked from scratch and we all sat down around the table to eat. It wasn't at all formal but she did put things in nice bowls to serve them. It seemed totally normal to me at the time but I realise now that all these things I took for granted have been lost from many people's lives. Perhaps because of the good ingredients and mum taking an extra moment to serve the veg in a bowl rather than the pan my siblings and I are all committed to the value of real food and hand-crafted things. It was never preached but we absorbed those values through the things in our lives and they have shaped who we are in core ways. My grandmother was good friends with a potter, Marianne De Trey, and her work was a constant theme in our home as well as those of the grantparents and aunts/uncles. We had a set of her plates that have been used on special occasions for as long as I can remember - in fact they have come to directly symbolise 'special occasion', if the Marianne plates are on the table then it must be an event! I also learned the value of food presentation for myself. As an early convert to vegetarianism with a bit of a competitive streak I always wanted to serve up a Christmas dish that would make even the carnivores say wow. Part of this was recipe selection but the choice of trimmings and platter also came to my aid, supporting my theatrical 'ta-da!' moment. Looking back now It comes as no surprise that I should go on to choose to design and make serving-ware! I love the way that good bowls and platters can add a little touch of value and quality to daily life, infusing even mundane moments with something a bit more special. Doing so they encourage us to slow down for a moment and pay attention, to look, to feel, to smell, to appreciate the efforts of the cook, to be present with our companions around the table. The simple act of plating up with a nice piece of serving-ware turns out to add a huge helping of value to our lives.